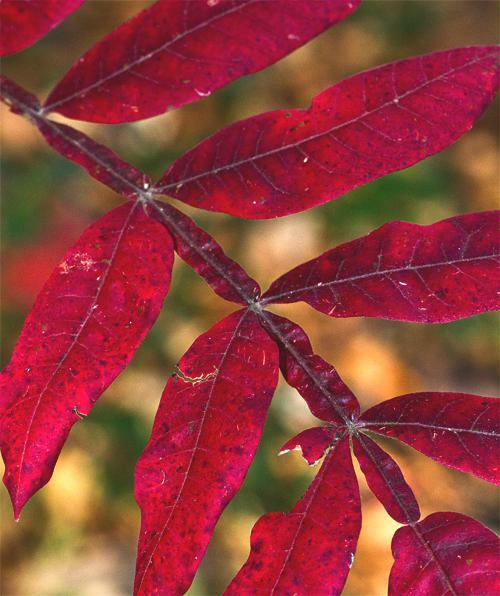 It's autumn at Hilton Pond Center and it's amazing how quickly things change in the natural world, with once-green leaves like those of Winged Sumac (above) taking on hues of yellow, orange, or red and then cascading to the forest floor. Our Goldenrod meadow that brightened the landscape in early October has by month's end become an expanse of brown, with flower heads of wispy white (below) giving no hint they once glowed a brilliant yellow as the afternoon sun sank low on the horizon. As we walked around Hilton Pond during waning days of fall we saw ever-fewer signs of vibrant flora whose green foliage and colorful blossoms had brightened summer days, but we took considerable satisfaction in looking at all the ways these very same plants make it through the inevitable cold months. Woody trees and shrubs will survive just fine, of course, but most herbaceous growth withers to the ground, with annuals dying all the way to the tips of their outermost roots. 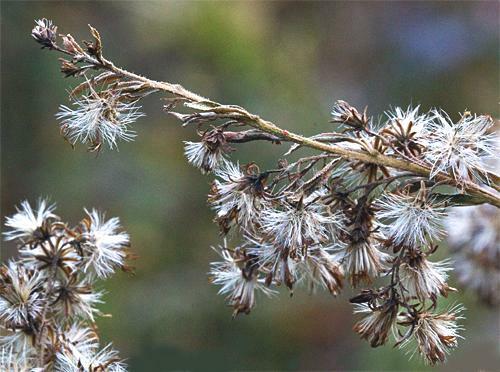 As insurance--i.e., to make sure their genes are not lost forever--all these plants do have ways of "Getting Ready For Winter," a very interesting phenomenon we briefly document below with words and images. 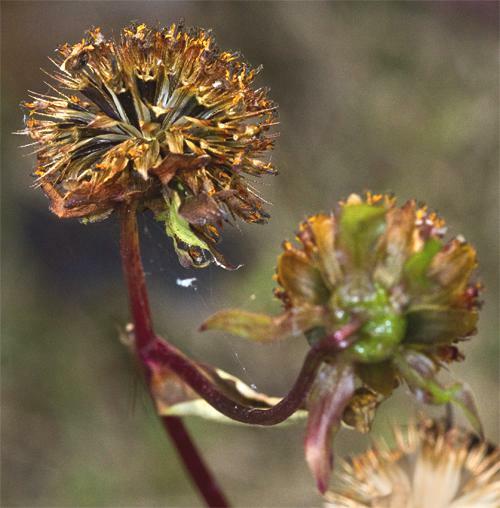 For the most part, flowering plants across the Carolina Piedmont have finished blooming by the end of October--notable exceptions occurring among several members of the Sunflower Family (Compositae or Asteraceae). 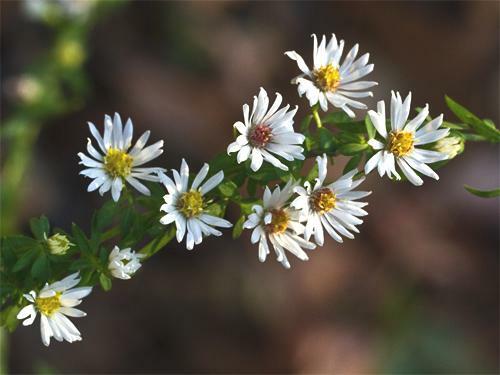 For example, on the muddy banks of Hilton Pond we found a tiny white autumn aster (above) scarcely three-eights of an inch across still in flower; as one of those DWC's ("damned white composites") it will remain unidentified until a better botanist comes along. Not far away on the pond bank a small patch of bright yellow-orange sunflowers also still had blossoms, absorbing water from wet mud while basking in rays of autumn sunshine. Alas, this eye-pleasing two-inch-wide DYC also goes without a name, but not knowing what it is doesn't diminish our appreciation for its ability to continue blooming long after most flowering plants have retired for the season. 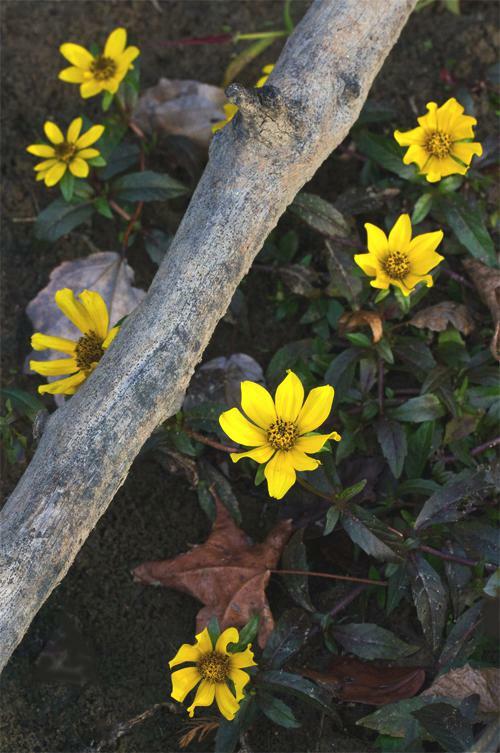 Plants that HAVE finished flowering include some of the other composites at Hilton Pond Center, including our lone specimen of Schweinitz's Sunflower--an endangered species from the Piedmont Prairie that dominated much of what is now the Charlotte NC metropolitan area. Unlike familiar sunflower seeds folks offer in their bird feeders, the fruit of Schweinitz's is a "nutlet"--a naked seed that lacks a fleshy pulp. 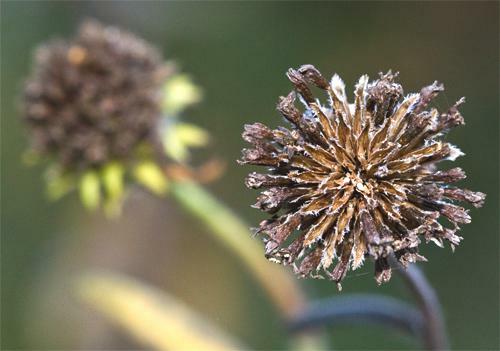 Alas, even though our beloved Schweinitz's Sunflower blooms every year, we've yet to see a fertile nutlet in any of the dried flower clusters (above)--we think because seed production may require cross-pollination with a second plant. One sure sign some of the composites have been attracting pollinators AND setting seed is evident when we returned this week from taking pictures to find our pant legs covered with hitchhikers, AKA "tickseeds" or "tag-alongs." These are the fruit of another of the sunflowers--again, we're not sure exactly which--but the seeds are almost certainly from a Bidens species. If you don't know what we mean by "tickseed," take a look at the photo at right and you may remember getting these little stick-tights stuck on you as you wandered a meadow or roadside in early autumn. The banks of Hilton Pond turned out to be ideal places to look for plants "getting ready for winter," if only because their activities were exposed and easy to see. We like to watch our luxurious patch of Swamp Milkweed sprout each spring, knowing its leaves will feed Monarch caterpillars and its pinkish flowers end up attracting all sorts of bees and butterflies--and even hummingbirds. 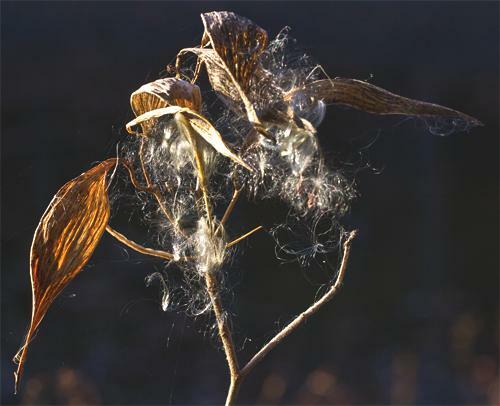 Those milkweed blooms eventually produce an awl-shaped pod containing dozens of flat seeds, each adorned with silken threads that glisten in the autumn sun and catch the wind--using fall zephyrs to propagate the mother plant over considerable distance. And right beside the pod-bearing milkweed was a thriving colony of sedges (above), identifiable by their three-sided stems. 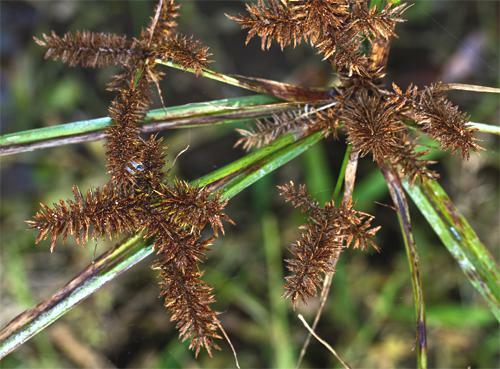 These monocots--which superficially resembles grasses but are only distantly related to them--typically produce fruiting bodies on spikes growing from axils of their spirally configured grass-like leaves. The seeds are brown and dry as shown in the photo but are consumed in great quantities by waterfowl and small passerine birds as the winter season progresses. That's probably why sedges are among the most common of all wetland plants. Seeds, of course, are the way this particular sedge makes sure its genes get passed on through future generations. Each seed--bearing DNA of its parent plant(s)--is a "fruit" even though many folks only associate that word with big succulent items like apples and oranges and cherries. 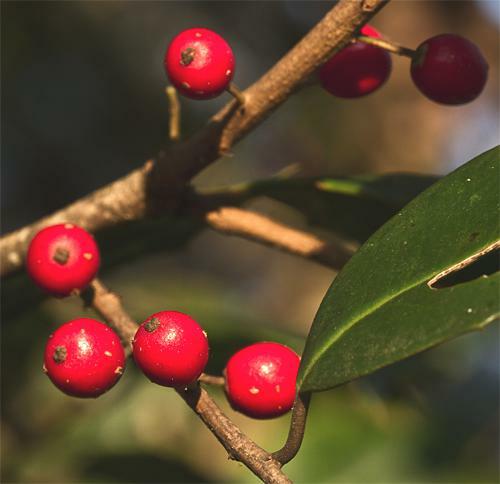 Actually, there are LOTS of showy wild fruits produced by plants at Hilton Pond Center, from Common Persimmons to Black Walnuts to Muscadine grapes, and from Poison Ivy berries to the crimson-colored American Holly drupes shown above. (Drupes usually are fruits with a seed or seeds enclosed by a pulp, as in peaches and cherries; American Holly happens to have four seeds.) That said, most of our showy wild fruits are already gone by late October, ingested by some bird or small mammal that--in turn--deposited a pile of seeds in its droppings. We suspect those holly berries in our photo must be insufficiently ripe, low in nutrition, and/or offensive to the palate; otherwise, something so brightly colored surely would have been consumed by now. Among the most prolific fruiting trees at the Center are our Flowering Dogwoods, whose spring blossoms give rise to clusters of fall berries just as bright as those of American Holly. Dogwood berries must taste better, however, because sometimes they get stripped from branches while they're still mostly green. Curiously, birds swallow them whole but our Eastern Gray Squirrels and Eastern Chipmunks peel off the skin and meat and consume mainly seeds within--thus littering the back deck of the Center's old farmhouse with thousands upon thousands of moist red berry fragments. It's interesting to see that while dogwoods are "getting ready for winter" they're also preparing for next spring--as shown by purplish terminal buds like the one above. 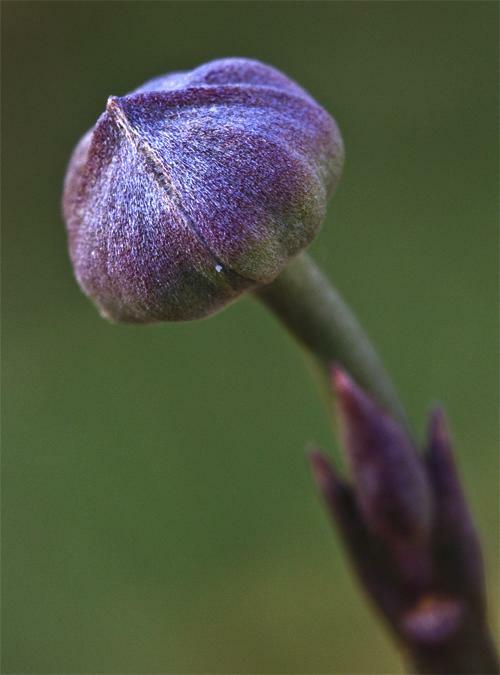 Serving as a shelter from cold and ice, this bulbous bud will burst forth in April, revealing that familiar dogwood inflorescence. It's worth mentioning that only some terminal buds on Flowering Dogwood twigs are big and round and capable of producing flowers. The vast majority are long and slender like the structure above that will give rise to tender green leaves come spring--leaves that gain increasing importance as they mature and start carrying out photosynthesis. 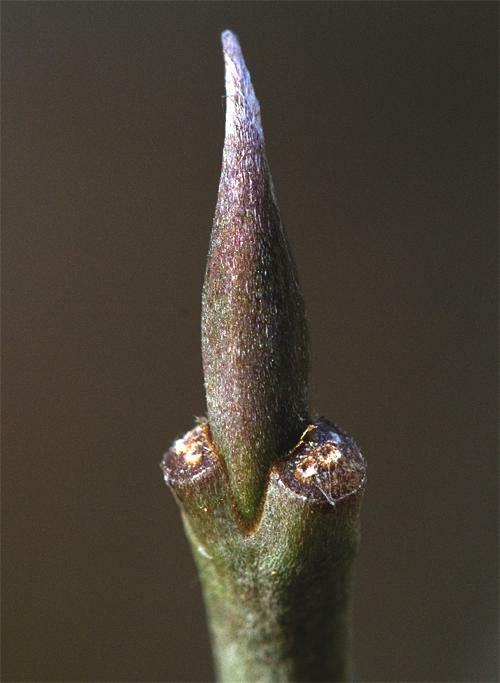 One interesting thing revealed by the close-up view above is two scars on opposite sides of the bud's base. These were left behind by leaf petioles when the deciduous dogwood began losing its foliage; also visible are two round structures, remnants of the vascular network that took minerals and water up to the leaves and returned simple sugars to the rest of the tree. Although woody plants like American Dogwoods do "get ready for winter" by dropping leaves and tightening up their terminal buds, herbaceous plants (as mentioned above) often wither and die. Such is the case with most ferns--plants with a tropical heritage that are ill-adapted for really cold weather. 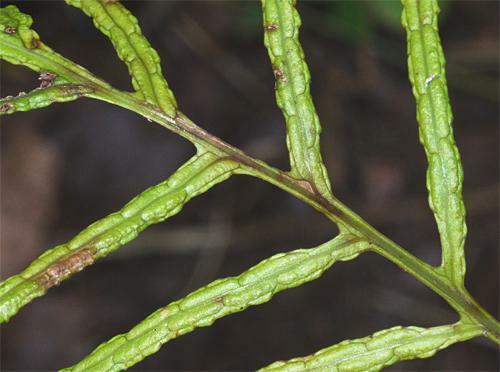 In the case of Netted Chair Fern, its two-foot-tall sterile fronds (above) begin to turn brown in autumn and eventually die--leaving only the underground rhizome that will produce next year's fronds. Interestingly, the Netted Chain Fern also can make specialized fertile fronds that have much narrower lobes (above). While the sterile fronds' function is photosynthesis, the fertile frond exists as a fruit-bearing structure. 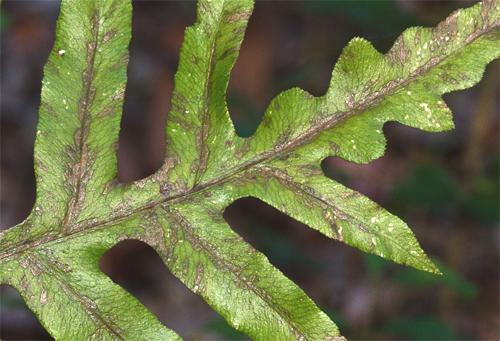 Turn over those skinny lobes and you'll find a leaf surface covered with spores that propagate the fern. In this photo essay we've barely scratched the surface of how plants prepare for the upcoming cold season. Examples included here we found in just a few hours while circumnavigating Hilton Pond, and we bet you can discover about as many in your own backyard or at a nearby natural area. Go out and take a look; it'll give you something to think about as you--like the plants around us--are "getting ready for winter." Thanks to the following fine folks for recent gifts in support of Hilton Pond Center for Piedmont Natural History and/or Operation RubyThroat: The Hummingbird Project. Your tax-deductible contributions allow us to continue writing, photographing, and sharing "This Week at Hilton Pond" with students, teachers, and the general public. Please see Support or look below if you'd like to make a tax-deductible gift of your own. Several alumni (see below) of our 17 previous Operation RubyThroat hummingbird expeditions to Costa Rica, Guatemala & Belize are our first "Mist Net Sponsors." 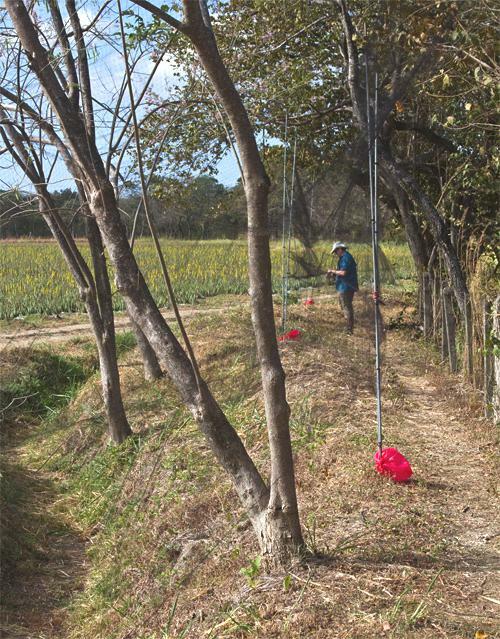 They recently made generous tax-deductible donations to purchase new $125 mist nets used to capture and band Ruby-throated Hummingbirds--and other Neotropical migrants--in Central America and at Hilton Pond Center. (Photo at right shows a line of mist nets edging an Aloe Vera field last year in Guanacaste Province, Costa Rica.) Non-alumni also can become Mist Net Sponsors by contributing via "PayPal" or "Network for Good" by clicking on logos in the section just below. You can also send a check to the Center at 1432 DeVinney Road, York SC 29745. Full net sponsorships are $125, but your tax-deductible gift of any size is always welcome. --For ten days in late October we were in south-central West Virginia working with a volunteer crew at Hilton Pond's "sister center"--the New River Birding & Nature Center in Fayette County. We were supervising an AmeriCorps team extending a boardwalk that accesses a beaver-maintained wetland where staff can teach students and adults first-hand about watersheds and how wetlands work. We banded a few birds there, also: Dark-eyed Juncos, Golden-crowned Kinglets & White-throated Sparrows--species that for the most part haven't gotten to Hilton Pond Center just yet. We also recaptured a Carolina Chickadee we banded last year at NRBNC. --Despite being gone from Hilton Pond for much of the period we did manage to band 14 species here at home--including a locally scarce Hairy Woodpecker female (only our 25th since 1982) and the first Tennessee Warblers of the year. --A male Carolina Chickadee recaptured on 12 Oct was banded locally as a recent fledgling 'way back in August 2006, making him a seventh-year bird and the oldest-ever of his species documented at Hilton Pond. --Spotted a solitary Mourning Cloak butterfly at Hilton Pond Center on 18 Oct; it was trying to get one last sip of nectar from one of our hummingbird feeders. --If you missed last week's photo essay it was about a Red-breasted Nuthatch banded at Hilton Pond Center --only our 22th of this species since 1982. See Installment #554.